Known as Lemberg in German and Lwów in Polish, the city of L’viv in modern Ukraine was in the crosshairs of imperial and national aspirations for much of the twentieth century. This book tells the compelling story of how its inhabitants (Roman Catholic Poles, Greek Catholic Ukrainians, and Jews) reacted to the sweeping political changes during and after World Wars I and II. The Eastern Front shifted back and forth, and the city changed hands seven times. At the end of each war, L'viv found itself in the hands of a different state. While serious tensions had existed among Poles, Ukrainians/Ruthenians, and Jews in the city, before 1914 eruptions of violence were still infrequent. The changes of political control over the city during World War I led to increased intergroup frictions, new power relations, and episodes of shocking violence, particularly against Jews. The city’s incorporation into the independent Polish Republic in November 1918 after a brief period of Ukrainian rule sparked intensified conflict. Ukrainians faced discrimination and political repression under the new government, and Ukrainian nationalists attacked the Polish state. In the 1930s, anti-Semitism increased sharply. During World War II, the city experienced first Soviet rule, then Nazi occupation, and finally Soviet conquest. The Nazis deported and murdered nearly all of the city’s large Jewish population, and at the end of the war the Soviet forces expelled the city’s Polish inhabitants. 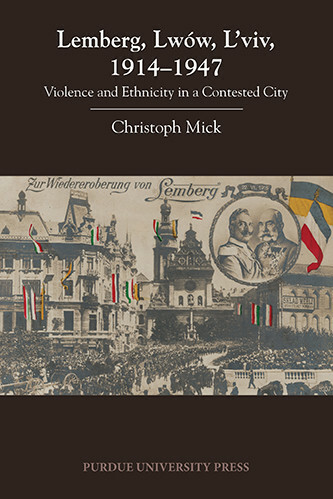 Based on archival research conducted in L’viv, Kiev, Warsaw, Vienna, Berlin, and Moscow, as well as an array of contemporary printed sources and scholarly studies, this book examines how the inhabitants of the city reacted to the changes in political control, and how ethnic and national ideologies shaped their dealings with each other. 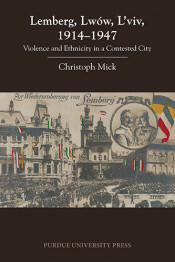 An earlier German version of this volume was published as Kriegserfahrungen in einer multiethnischen Stadt: Lemberg 1914‒1947 (2011). Christoph Mick is a professor of history at the University of Warwick, United Kingdom. His research interests include the modern history of Russia and Eastern Europe, especially Poland and the Ukraine. He earned his PhD at the University of Tübingen and has authored numerous articles and several books in German. In 2012, he received an award from the Börsenhandel des Deutschen Buchhandels to cover the cost of translating Kriegserfahrungen in einer multiethnischen Stadt: Lemberg 1914‒1947 into English. The book was shortlisted for the Prize “Pro Historia Polonorum” of the Senate of the Republic of Poland for the best book on Polish history published in a foreign language between 2007 and 2011.